I have been following this story since it happened. There is absolutely no doubt in my mind that this guy is at the very least a sociopath. I never believed his initial claim that his wife strangled their daughters. He looks so “normal” and “nice” but if you look at his eyes; there is no life….much like Scott Peterson’s. For him to dispose of his sweet little girls in oil tanks is something I just can’t wrap my head around. This whole “picture perfect family” struck a chord with me. In my own marriage I thought all was as it seemed. How chilling to know I was once sleeping with someone who could possibly have done the same thing to me and my child should something have triggered him to SNAP! Newlife4me, extremely chilling to know we all slept next to such evil. My ex no doubt is capable of this kind of evil. This was part of why subconsciously I did not leave sooner. When my mind finally awaken to see who he really was, I literally packed up the car & drove 3000 miles away, as I knew he would kill me. I still have fear. My ex is pure pure pure evil. Very covert, cunning, past violence & has so much hatred for everyone that is normal plus zero remorse. I worry for the safety of those that are now tangled up in his hellish world. Such a scary world. Now we know why, when we are children, we are scared of the dark. That is are primal gut instinct kicking in to make sure we stay safe from evil on this planet. the first time I heard his ‘interview’ on TV; I KNEW he was a psychopath. Those dead-fish eyes, those ‘flat’ responses..he was a human robot. Lying to his mistress? What else will be found out about him. I sympathize with HIS family; they likely had NO idea who or what he was. Hers will have this cross to bear for their lifetimes.He WILL have to housed separate from other prisoners; child killers/pregnant wife killers are scum to other convicts. He wont last long, if HE’s not protected. Regretfullymine, me too, he was just to dead cold & lacked of ANY emotion, when he was giving his tv news interview. I think this is why the police push for the spouse or parent of a child that was killed or missing to go on national tv. So that they can watch their behavior under pressure. This guy was way to cool & calm during the interview. Most people would be nervous to give an interview on tv…let alone if one of their loved ones were missing. Not him. My ex was the same way. Just dead in the soul & eyes. I think you are correct he will not last long. As for his family, someone in the blood line is also a psychopath. Ahhh, his mistress just came out with an interview, and she reported that he lied about everything. That he told her he was going through a mutual divorce, and that they were in the process of finalizing the paperwork. For someone to murder innocent children like that, would definitely a sociopath. Sounds typical for a sociopath to cheat on their spouse, and lie to their mistress, so they can get away with cheating. That just shows how revengeful sociopaths can be, and to stay far away from them. More likely, a Psychopath. The way he just dumped his pregnant wife Shannon in a shallow grave & his children in the oil container, shows how little regard he has for human life. They were just objects to him. Heart wrenching for his wife & children to endure such horror prior to dying. My heart breaks for her family to live with this pain for the rest of their lives. His family actually believe his lies that she (the wife) kids his children. That is how easy psychopaths can get people to believe their lies. I hope he riots in prison. RIP to Shannon & her three beautiful children. “Shanann’s phone that was searched as well after her body was recovered, revealing that she had been on GroupOn searching for a way to afford a cheap weekend escape for her and Chris. At the same time, Watts was with Kessinger discussing his next steps and the apartment he planned to get when he separated from his wife. He had told Shanann he was at a baseball game, but her suspicions had grown so strong that she told friends of her plan to confront her husband when she returned from her work trip in Arizona. In a text sent to her friend Ady, Shannon wrote out the entire speech she planned to deliver on Monday, after she had returned home and gotten some rest. ‘Can you please tell me something, because just like you, I’m in my head? I try to fix things and make them better and this is making me crazy. I know that you need time. I want to give you what you’re asking for and respect your space, I need some time. This place that I’m in, in my head, is not a good place,’ read the text. They do make you feel like you are going crazy. Your mind is in overdrive trying to figure out how to fix the relationship. But, In fact you really need to figure out how to escape the relationship instead. This takes time in your mind to figure out stop fixing the relationship & just escape asap. Very sad. It’s hard to think of the hell she had endured for a long time by her psychopath husband but also the night she returned home & confronted him. And what he did to his own flesh & blood (his innocent children) is absolutely horrific. I came across the Watts case by accident, letting my YouTube just play the next video randomly. Suddenly I was watching a home video of a beautiful woman describing her happy life, and I ALMOST changed it (thinking it was an ad) except I heard her say that her now husband got together with her when she was really sick, actually adamantly insisted on being together with her despite her illness. This may seem sweet to most people, but to my trained ears that was a warning bell. A sociopath seems to love a woman who is at a disadvantage, and a woman with chronic illness is going to always be at a slight disadvantage and ever indebted to them. Then, I found out that she had bought her own home shortly before meeting him (Chris Watts), and that was the next warning bell for me. She was sitting on a gold mine that he was just waiting to tap into (and indeed, despite her obvious industriousness, they soon went into massive debt). Pretty soon, the case went where I was scared it would go, and the woman and her two children were killed by Chris Watts. I watched a couple other videos and saw a few more hallmarks of a man so similar to my own ex-husband, it gave me the hee-bee-gee-bees. He had a similar body type, and his movements were spot on to my ex-husband. But the reading glasses were the worst. WHENEVER my ex was in trouble or wanted to appear sweet or innocent, out came the reading glasses and he wore them sometimes for days on end when needed. Yet when he needed to appear tough and manly those glasses were nowhere to be found. Same with Chris Watts! In none of his former pictures when he is trying to appear physically fit and healthy do you see that guy wearing glasses, but the entire time he is on trial it’s his “I’m a harmless guy with glasses”. 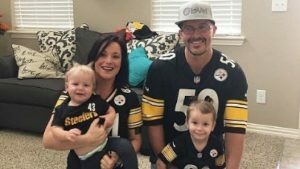 The need for Chris Watts to keep his wife at a disadvantage, I believe, is what led him to convince her to have a third child. Even though her first two pregnancies were very tough, even though they were in massive debt, even though we would find out later he was already thinking of how to exit the marriage… it was him convincing her to get pregnant and stay at a distinct disadvantage. Chris Watts mother, leaving out a bowl of peanuts for her highly allergic grandchildren was such a flashback to me of my former mother in law! The sociopathic DNA donating mother-in-laws of the world are truly amazing people to deal with, I know from a decade of hands-on experience! Women like Chris Watt’s mother are great for a complete mind-trip every time the poor wife sees them, whether they are trying to ostracize her from the family, ignore her, spoil her wedding, spoil a birthday party, leave razorblades where the kids can find it, you name it! The way Chris’s family treated Shanann was very familiar, in a predator-prey relationship. Her simply marrying Chris was like waving a banner that said “I am the prey, attack me!” A pack of hyenas hunting don’t all attack different deers during the hunt, they single out the weak one, and once one of them attacks the weak one they all descend upon it. Same with a situation like what Shanann found herself struggling with. So sad!